I posted previously a recipe for Coco Flan and Pumpkin Flan but I just realized that I hadn’t posted a recipe for the Classic Leche Flan with just milk and eggs and no additional flavoring. Since I had 8 egg yolks that needed to be used up, I decided to make flan for our Easter dinner dessert. A great way to celebrate the egg. Whisk all the ingredients together until well blended or you can also use a blender. Place the pan over medium heat until sugar is melted and bubbly. Cook just until you get an nice amber color. Don’t leave it too long or the sugar will burn. I used thongs to hold the pan over the heat and to swirl the sugar mixture around to coat the bottom of the pan. Let the caramel cool before pouring in the flan mixture. Once you have your caramelized sugar ready, you can pour the flan mixture into the pans, dividing equally. Make sure you pour the mixture through a sieve to catch any remaining solids from the egg. This will give you a smoother flan. 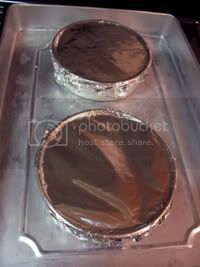 Cover each pan with foil and place in a large pan with sides. Place the pan in an oven (pre-heat to 350 degrees F) and pour enough hot water in the pan so that the level comes almost half way up the sides of the round pans. Cook at 350 degrees F for one hour or until the center of the flan is no longer jiggly. You can cook it faster at a higher temp, but if you let the flan mixture come to a boil, you will end up with craters or holes throughout your flan. Some people don’t mind the craters, it certainly doesn’t take away from the flavor, but to others, the sign of a good flan is the absence of craters. Most flan recipes call for egg yolks rather than whole eggs because that distinct ‘eggy’ flavor and aroma is mainly found on the albumen or whites of the egg. Some people find it unpleasant, but I don’t really mind. I’ve had flans with whole eggs and they weren’t bad at all. I just prefer the Filipino version of flan which uses mainly egg yolks and I think is a bit denser and full flavored than other versions. To unmold, simply run a knife around the edge cover with your serving dish and turn over. Lift up the pan and it should lift right up, the caramelized sugar flowing to make a nice sauce over the dish. i baked your recipe in 4 inch ramekins.. my flan looked like swiss cheese.. boo hoo..
however, i realized i had bake it for 2 hrs like your recipe — but you had a bigger pan..
was that the reason? how long should i bake it if in 4 in ramekin? hi. thanks for sharing this recipe, try ko siya this christmas, sana ma-perfect ko. favorite ng husband ko ang leche flan, that’s why gusto ko m-perfect ang paggawa. I LOVE LECHE FLAN with LOTS AND LOTS of holes, to me, they taste better than the solid ones. What’s the trick to making them with holes? Does anyone know? Thanks. Romy, the trick to making the holes is to let your flan come to a strong simmer, almost boiling. That means that if you’re going to bake it, you can either go with higher temp or not use the water bath. If you are steaming your flan, then you can let your water boil a little more vigorously. High heat will create bubbles in your flan mixture as it cooks. hi thanks for this recipe! just wondering, when should i unmold? should i wait for it to cool in the freezer or could i just unmold it right away after i have brought it out of the oven/steamer? hi, thanks for the flan recipe. I’m going to try it, along with the pumpkin one. I’ve never made flan, but always wanted too. Thanks for sharing, and it looks delicious!! Keep up the great work you do here. Thanks JMom! I’ll take your tips. 🙂 It’s so sweet that your daughter is the resident flan-maker. We’re all learning every day.. Love your recipe! Hi Maria, I am glad you tried the recipe. To cut down on the sweetness, try using only half of the condensed milk since that is the main source of sugar and keep the rest of the ingredients the same proportion. You can also cut down on the number of eggs to cut down some of the richness. when making your caramel syrup, you can also add more water to cut down on the concentration of sugar, making a lighter colored syrup. Hope those tips help you. 🙂 My daughter is now the resident flan maker at our house and she changes her proportions all the time. Don’t be afraid to play with it. Hi Anon, you can tell the flan is set by jiggling it. The center should move slightly but not too loosely. When it looks firm, then your flan is set and ready to be taken out. If you’re still not sure, insert a butter knife in the center to feel if the flan is set to your liking. If you’re making your flan in individual containers, the cooking time will be shorter. Check halfway through the baking time to see if they are done. If not, then check every 10 minutes after that. How can you tell if the flan is truly set? I made mine using mini molds made of pyrex glass so they could be individual servings. Does this change the baking time? Hi Angie, kung wala kang oven, pwede mong i-steam. All you have to do is get a large pot than your leche flan container. Put a rack or a can or another pan into the pot and fill it with water up to near the top of the rack. Put your leche flan pan that has been covered with foil on top of the pan, making sure the water level is not touching the bottom of your leche flan pan. Cover and bring to a slow boil. Depending on the size and depth of the pan you’re using for your leche flan, cook if for 30 minutes to an hour, or until the flan is set. That’s it! Hope it comes out well for you. hello po! ask ko lang if ever i don’t have the oven, how can i cook it into a stove? I am looking forward to trying out your recipe. 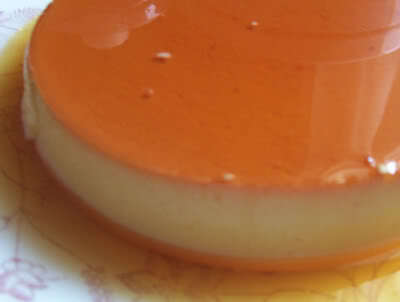 I have always made creme caramel which shares similarities of leche flan but doesn’t share the same richness. There is nothing quite like a leche flan to satisfy a sweet tooth such as mine. Hi Sha, oh that philly cream cheese addition sounds good. I’ll have to try that one out. Hi Emer, no difference, really between the steaming and baking. The result is the same. I’ve also tried pressure cooking it (if you dare ;)) and it only takes 15 minutes when you do it this way. The baked method to me, is just easier because I don’t have a steamer big enough for two pans. Hi tita Stel! thank you 🙂 Asi actually asked me to make some again but I told her to please give my arteries a chance to recover. hehe! Hi NDB, sorry about that, I’ve edited the recipe to include the sizes of the canned milk. We cook our leche flan steamed and not baked and it only take 45 mins to cook. Just wondering what’s the difference between the two methods. naku nami-miss ko na ang leche flan tuloy… that’s looks so yummy! I think my husband’s leche flan has serious competition in yours! Looks so rich, bad and sinful! I’ve made flan with cream and milk before, but have yet to try the more traditional canned condensed and evaporated milks. Your flan looks wonderful. this is such a filipino classic, i won’t ever tire of eating it. your version looks perfect. Did you use a small or big can of evaporated milk and what’s the amount of the whole milk you used for the recipe? Kindly specify. Thanks! ang ganda at ang kinis ng leche flan mo JMommy!!! I haven’t eaten flan in ages…blame it on the gelaterie—there are so many of them that I hardly ever make any dessert that uses vast amounts of milk or eggs! RYC: I was wondering if monkfish would go good in sinigang. I’ve got those Mama Sita soup base mixes which are just sitting in the cupboard! hi munchkin mommy, yeah, I wish we had more people to share with so my daughter Asi wouldn’t have had to eat it all ourselves. lol! With the caramelizing, I found if I take the sugar mixture off the heat before it gets to the color I want, it usually comes out perfect as it continues to melt from the heat of the pan. Also, try not to stir the sugar mixture while your caramelizing it. I found that when stirred, it becomes crystallized. gimme gimme! 😀 i can’t resist the call of leche flan. hee hee! i will try your version. it’s amazing how there are so many versions of leche flan. my only problem is caramelizing the sugar. i’m never consistent with it. so good luck to me! hahaha!